The world is greatly indebted to Jacques Jaubert, Sophie Verheyden, and the other listed authors and unlisted assistants for their just-published Letter in Nature magazine titled Early Neanderthal constructions deep in Bruniquel Cave in southwestern France, 25 May 2016, doi:10.1038/nature18291. Thank you for this new, wonderful site out of the pages of human history! However, there are serious problems with the interpretation of the site, including its "ceremonial significance", its chronological dating and its assignment to the Neanderthals. We offer some new solutions below based upon our decipherment of the site. Our purpose is not to criticize, but to add new understanding. Thank you. "Very little is known about Neanderthal cultures1, particularly early ones. Other than lithic implements and exceptional bone tools2, very few artefacts have been preserved. While those that do remain include red and black pigments3 and burial sites4, these indications of modernity are extremely sparse and few have been precisely dated, thus greatly limiting our knowledge of these predecessors of modern humans5. Here we report the dating of annular constructions made of broken stalagmites found deep in Bruniquel Cave in southwest France. The regular geometry of the stalagmite circles, the arrangement of broken stalagmites and several traces of fire demonstrate the anthropogenic origin of these constructions. Uranium-series dating of stalagmite regrowths on the structures and on burnt bone, combined with the dating of stalagmite tips in the structures, give a reliable and replicated age of 176.5 thousand years (±2.1 thousand years), making these edifices among the oldest known well-dated constructions made by humans. Their presence at 336 metres from the entrance of the cave indicates that humans from this period had already mastered the underground environment, which can be considered a major step in human modernity." The mainstream scholars do not know what the Bruniquel Cave "Ring" Construction signifies beyond some inkling that the site may have had some "ceremonial significance". That lack of knowledge is not surprising. Archaeologists are not astronomers. Astronomers are not archaeologists. This has left an expertise vacuum in scholarly study of the history of humankind. Even archaeoastronomy concentrates too much on lunar and solar alignments and leaves out the stars -- which for prehistoric peoples were more important. 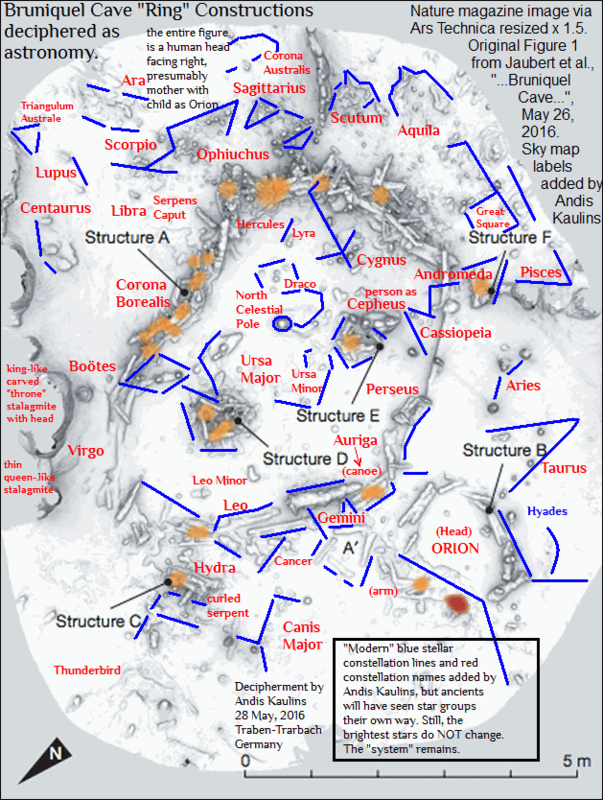 We are pleased to report here that we have deciphered the stalagmite circle constructions at Bruniquel Cave as astronomy -- specifically, as a sky map of the heavens in the hermetic sense of "as above, so below". Individual stalagmites portray stars in the heavens. The entire sky is portrayed as a female human head facing right with Orion as the head of an infant child also facing right. Groups of stars are formed into figures by the stalagmites, especially on the larger "ring". The Solstices and Equinoxes are marked. Pisces is the head of a fish, Cepheus is a person prostrate sidewise, with another person kneeling "bedside", presumably at birth. Auriga is a canoe. Aquila and Cygnus are flying birds. Boötes and Virgo are represented at the side also by carved intact stalagmites. Boötes is the regally crowned head of a man sitting on a throne with a thin ceremonially dressed (based on the carvings) female beside him. Hydra is a curled serpent. Corona Borealis is the head of an animal like a cat. There will be more. We mention only those that were most apparent. We present our decipherment of the Bruniquel Cave "Ring" Constructions below in two drawings. The first image further below is our own fully independent "rough" decipherment illustration that we have prepared to meet any possible copyright complaints. We use it for decipherment purposes only, with no claims to accuracy in the illustrative part, which is very "approximate". The second image is a "fair use" reproduction of the original "Figure 1" in the Nature letter with our labeling of the identification of our deciphered stellar constellations and astronomical parameters (North Celestial Pole, Solstices, Equinoxes). It is eminently clear that the sophistication of this hermetic star sky map and attendant astronomical parameters can by no stretch of the imagination be dated anywhere near the claimed age of 176.5 thousand years. What the source of this error could be is discussed subsequently. Moreover, the constructors of the Bruniquel Cave rings are unlikely to have been "Neanderthals", but, rather, relatives of an emerging Cro-Magnon human culture defined as "Magdalenian", a culture which coincides with modern DNA evidence of the advent of "modern-like" humans in Europe ca. 40000 B.C. That date also meshes well with a burned bone found at Bruniquel in 1999 that could not be older than about 45000 B.C., based on radiocarbon dating. Indeed, the astronomical system of notation used at Bruniquel Cave shows some parallels to nearby sites such as Lascaux, the "notation" found at the Temples of Malta, and also at Ancient Britain's Kents Cavern "Cave of Inscriptions", all of which we have previously deciphered as astronomy (Lascaux, Malta Temples) long before others saw any astronomical connection. 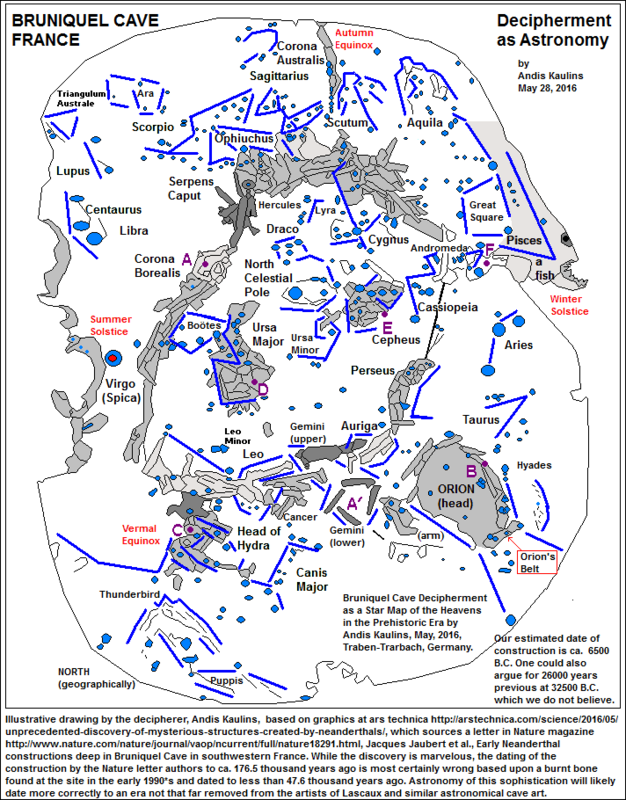 Indeed, the stellar orientation of Bruniquel is the same as our general megalithic sky map of France at megaliths.net. Our astronomical decipherment completely contradicts the idea that the age of the Bruniquel Cave "Ring" Construction is 176.5 thousand years, a date based on speleothem dating. Our astronomical decipherment shows a sky of stars ca. 6500 B.C., or, if we add one precessional turn, ca. 32500 B.C. The ring construction can not be much older than that and we think that 6500 B.C. looks pretty good, otherwise you have too many years inbetween high tech invention and then -- nothing -- for thousands of years. That is not believable. We are not versed in the dating of speleothems viz. cave stalagmites or broken-off stalagmite pieces, but this study likely involves a significant mainstream dating error. According to Emil Silvestru at Caves and Age, absolute dating using speleothems is fraught with enormous difficulty and involves many totally unproven assumptions, so that the dates obtained are of little value for absolute dating and are little better than reading tea leaves. Most chronological dating systems are based on "assumptions" and those can be and often have been proven to be faulty. The cave art at Lascaux, for example, not too long ago was dated to well over 30000 years ago, a date we strongly criticized at the time. Now one reads much lower "mainstream" estimated dates for the Lascaux cave art such as ca. 17000 years ago, and even that will be too high, given what our astronomical decipherments tell us. In the unlikely case that the stalagmite dating were correct, the only remaining possible source of mainstream error would be in assuming that the date of construction of the Bruniquel rings coincided with the date of the breaking off of the stalagmites -- dates which do not have to coincide. Conclusion: This was not a difficult decipherment and was completed in a couple of days because most of the stellar identifications were fairly obvious. As always, numerous questions remain, especially concerning the chronological dating of the Bruniquel Cave ring and appurtenant constructions. Decipherment improvements in detail surely can and will be made down the road, especially in terms of identifying the figures portrayed by stalagmite groups. The photographs available online are too limited in scope to allow the making of certain identifications of portrayed figures. However, there is no doubt about the general correctness of the astronomical decipherment here presented. The fundamental analysis is simply too clear to be subject to any kind of serious, sustained challenge.